Minister of Tourism and Environmental Affairs Moses Vilakati says the Kingdom of Eswatini will host its own tourism expo to feature other countries come next year. This was revealed by the minister after witnessing the World Travel Market (WTM) Africa held in Cape Town this past week. 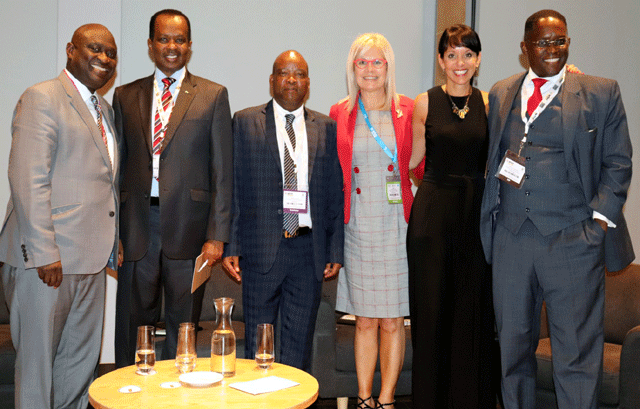 The minister led a delegation of local business in the tourism and hospitality sector to the annual three day trade show which was hosted by the City of Cape Town. The show started on Wednesday and ended on Friday. The minister said he was impressed with the set-up, the number of tourists as well as the tourism activity which comes with such events. He said he had a series of meetings with potential partners for this project and got positive support on assisting the country set up a similar trade show in Eswatini. “There is a lot that we have learnt from this event and are looking forward to hosting a similar show in Eswatini. We will start small and grow it bigger as time goes on. “This will obviously not compete with the existing International Trade Fair but will be focused on tourism since we know that this sector cuts across a large spectrum. We are looking at bringing all the industry players and outsiders for example Mozambican, Gauteng and Mpumalanga for a start. We have a made a deal with the WTM organisers to assist us and start up this kind of event. WTM hosts will be part of us to assist us to start up,” he said. The minister said they were still going to meet with the stakeholders led by the Eswatini Tourism Authority and design a strategy on how to implement this project. He said it was important to have this trade show stating that once the International Convention Centre currently under construction’s complete there would be a need for more such shows to keep the place busy. On another note the minister said he was excited with the success of the event as a whole. He said it is critical for the country’s industry players to take part in such shows stating that the participation will also attract assistance when the country reaches a stage where it hosts such events. “The interest people have shown to Eswatini is just amazing and one can tell that we all made good contacts and good deals that will attract more people to the country”, he said.